The Irish in Britain came to Edinburgh in their thousands. Inside the red jersey beats the heart of home. Munster, as ever, turned an away game in to a home fixture. The next journey is to the Ricoh in Coventry where Munster beat Saracens on April 20, 2008. Munster won the final that year. And we meet Saracens again on April 20, 2019. The checks will be made to see if there are communions and confirmations fixed for April 21. To the other faiths, and the faithless too, good luck to you all. We are the one. Was it fate or faith that got Munster through? Tadhg Beirne made his own luck. He has been accused of hamming up an injury after a silly elbow from Edinburgh prop Pierre Schoeman. The hosts had a penalty and the ref reversed his decision when Tadhg fell. Munster scored the winning try shortly afterwards. The way I see it is if Beirne dived and there was no foul, well that would have been totally unacceptable. But this was a bona fide penalty. The referee and his team had a very poor detection rate. The only way Beirne could have brought notice to the foul was to fall. It could also be that he was hurt. The comeback story is of Tyler Bleyendaal. He wouldn't be here but for Anthony Foley. Tyler was badly injured when he was a young recruit and Foley insisted he be kept on, saying: "We as a club need to look after the player - it's not a piece of meat we are dealing with." Bleyendaal was out for months this season and for most of last year. It was payback time. He kicked a massive touch well in to the Edinburgh 22 from the Beirne penalty. Then he won an overthrown lineout. Next was a lovely disguised pass into the back field, before landing a touchline conversion, which meant Edinburgh needed a try to win. The numerous kindnesses of Anthony Foley have survived his demise. This game flew as fast as the last day of the summer holidays. Back in the old days a wily old prop would have gone down with a sore leg. On would come the medicine man as slow as a steamroller going up Patrick's Hill. The fixer would throw a drop of water on the leg and then he would flex the knee, check to see if the ankle was still at the bottom of the leg, and gingerly discommode the thigh. On Saturday tired players were passed by and the game carried on relentlessly. It was non-stop. I hope Ireland will have learned lessons on how to play Scotland in the first game in Japan. Munster kicked away the ball with a minute left and they didn't get it back for nearly three minutes. 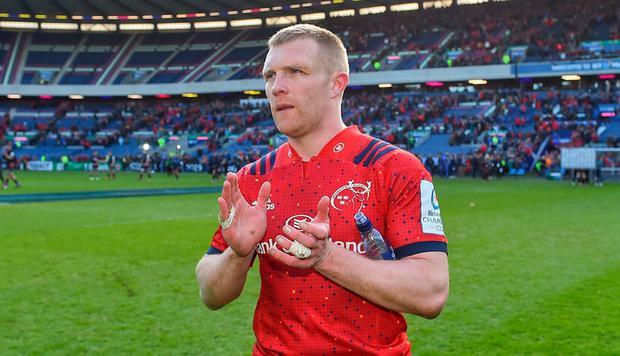 Munster were far from their best, but they know how to win. The always-present desire, courage and fire saw us through. Munster kept on digging deeper, into the very core of Munsterness, from where all fight begins. The Munster defence was very good. They only conceded one try, even though Edinburgh did most of the attacking and were probably the better team. The Munster lineouts were imaginative. There were three new moves outside the known set and Munster won all three. Keith Earls has won so many man of the match awards he could open up his own crystal store in Shannon Duty Free. Earls is a given for the Irish team in that first game in the World Cup. Andrew Conway has to be the next in line at full-back. He is so solid in the air, fast and a good tackler. Darren Sweetnam is ready now. He should be on first for every Munster game. Sweetnam is big in the tackle and a GAA player under the high ball. But there will be no repeat of 2008 unless Munster get better at the breakdown. Too often our players were isolated. They held on like Theresa May and paid the price when the Speaker whistled time up. Saracens were laughing and joking among themselves long before the end of the Glasgow game. They will be supremely confident and rightly so. This is the best English team ever. Back in 2008 Munster were hot favourites but this time those of you who bet on Saracens will need oven gloves to hold the docket. On paper Munster have only a small chance but the only game won on paper is noughts and crosses. Two years ago Sarries hammered Munster in Dublin. They are even better now. Munster need us all present and correct in Coventry on April 20. Yes, Munster do have a chance, because Munster always have a chance, no matter what and no matter where.